In Barbados, romance is all around. 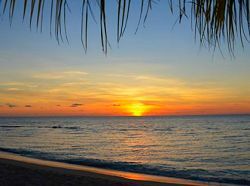 In the gorgeous sunsets over the Caribbean Sea; the sound of the waves lapping gently on the shore; the rhythmic swaying of the palm trees in the island breeze. Many who spend their honeymoon on our shores love it so much that they return again, some to celebrate special anniversaries and some nearly every year! We're always happy to welcome them back. Many of our hotels and resorts offer special honeymoon packages for guests, which typically include discounted rates, champagne & flowers on arrival and romantic activities such as a sunset catamaran cruise. If you wish to get married in Barbados, many hotels also provide wedding packages with full planning services and discounted rates for your guests. If you prefer, you can work directly with a local wedding planner who will arrange the marriage license, location, cake, flowers, music, photographer and anything else that will make your special day absolutely perfect! Eliminate some of the stress of planning your wedding, let a Barbados professional planner handle all the details. 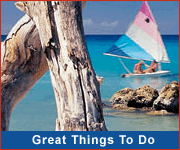 Enjoy walks on the many lovely beaches around the island and on the south coast and west coast boardwalks. For a quieter experience head over to the beaches of the east coast, especially at Bathsheba and Cattlewash. Spend an evening on the west or south-west coast of Barbados to enjoy the spectacular hues of orange, pink and red as the sun sets slowly into the Caribbean Sea. Share the unique thrill of a submarine dive at night as you join Atlantis Submarines exploring the ocean depths. Some couples have actually gotten married on the sub! Watch the sun set as you sail along the Barbados coastline with your love. Most catamarans provide canapes or dinner, along with wonderful music for a truly romantic experience. Hire a car and explore the island, just the two of you. Stop for quick dips in the ocean, tour the countryside, and enjoy breathtaking island views and vistas. There are so many distinctive restaurants in Barbados it's hard to recommend just a few... but here goes. Primo, overlooking a peaceful bay, is a long-time favourite of locals and visitors. The Fish Pot, with its beachfront location and elegant ambience is another wonderful choice. Champers, perched on a clifftop overlooking the ocean and Cin Cin, which has quickly become one of Barbados' top restaurants, are equally as good. You should treat yourself to at least one during your honeymoon. 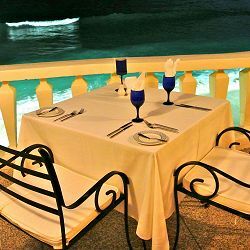 For charming casual dining, head to Cuz's Fish Stand near the Barbados Hilton Hotel or to Sand Dunes restaurant on the east coast. A night at the Oistins Fish fry, with great food, music & dancing, is a "must do" on any Barbados vacation! 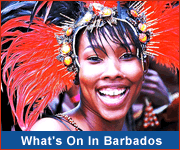 As if being a newlywed wasn't enough of a thrill, Barbados has lots more excitement in store for you! Party with the pirates on the Jolly Roger, take a island safari tour, hop on a submarine, or ride horses on the beach! These once in a lifetime experiences are the perfect way to begin your lives together. However you choose to enjoy your Barbados honeymoon, we wish you a wonderful time and all the best for your future.